Welcome to the Woods of Mahaffie subdivision located in Olathe, Kansas. 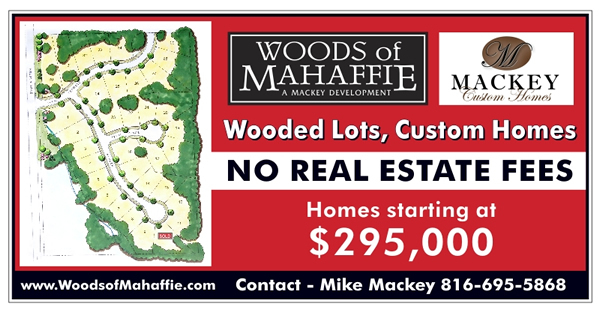 The Woods of Mahaffie includes 34 heavily wooded lots that are surrounded by a 25' tree preservation easement. 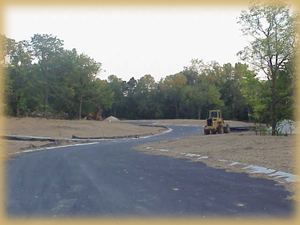 We are located near shopping, dining, major highway access, and walking trails. All homes in the community have 3 car garages, stucco fronts, and a generous landscape allowance. Mackey Custom Homes, Inc. has multiple floor plans to choose from or can customize a floor plan to fit your needs. Outside builders are welcome following approval by the developer. We look forward to making your dreams become a reality. Thank you for visiting the Woods of Mahaffie! From I-35 head West on 119th Street. Go through the intersection at Ridgeview, then turn left onto Nelson. Turn left into the community. Please contact the School District to confirm individual school and district boundaries. Copyright © 2008 Mackey Custom Homes, Inc.